If you’re a gamer, you know that sound quality matters. The speed at which we hear things is at 20 to 100 times faster than the speed at which we see things. When a sound system fully immerses you into every single blast and screech in the game, it can be like a genuine out-of-body experience. On the other hand, a poor-quality sound system makes for a flat and unengaging experience. The following products are among the most powerful and competitively-priced gaming speakers on the market that can take you away with high-end audio immersion. 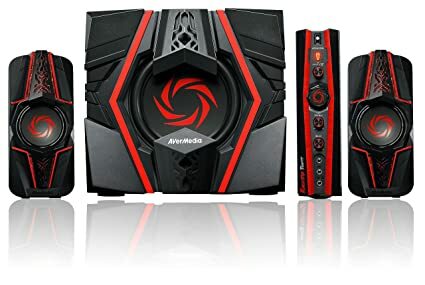 AVerMedia Ballista Trinity speakers are among the technologically sophisticated gaming speakers that have been specially designed for the purpose of video game immersion. To provide ample clarity and richness of bass, the speakers’ power rises up to as high as 77 Watts. The crystal clear sound is backed up with 3-way satellite speaker technology. The 3-way satellite speaker capability comes from the power of 75” twin dual channel satellite drivers. The drivers are further protected by the included of a ¾” ceramic-metal hybrid tweeter. With the tweeter and the satellite technology working in tandem, owners can have a smooth sound that operates on a structurally-protected frequency for consistent smoothness and audio reproduction. The Ballista Trinity’s satellite speakers themselves are fully mountable, giving the owner an extra degree of customization for the exact flow of audio that they desire. Thanks to the mountable speakers, owners won’t have to worry about the potential frustration that comes from inflexible setup options. For an added degree of versatility, the mountable satellite speakers have been given an extendable cable for easy access to any wall or shelf in the vicinity. There’s a keyhole built into the satellite speakers as well, which when paired with the solid base, makes it possible to fit them into just about any entertainment center. The Ballista Trinity’s 6.5” subwoofer is front-facing, which allows owners to experience the full impact of its dynamic bass. To make things more convenient for the owner, the speakers’ settings can be freely manipulated with the use of an independent control box. Different kinds of games are, naturally, going to be made with different models of audio configuration and sound direction; this means that adjusting the various parameters of the Ballista Trinity speakers will create a high variance in the sound experience while playing different games. With the independent control box, owners can freely adjust the levels of power, volume, bass, and treble. In addition to allowing the owner to manipulate all of the soft audio elements, the independent control box also gives the owner access to the headphone jack. One of the premier features of the Ballista Trinity is what’s billed as its “Assassin Mode”. In Assassin Mode, the level of detail and clarity in the speaker’s audio production is kicked up a notch. The clarity is enhanced specifically for higher frequency sound, deeper floors of bass, and warm mid-tones – this is all accomplished while actually keeping the overall volume of audio lower than normal. With the Ballista’s Assassin Mode, users won’t have to crank their volume up to the max just to compensate for anything lacking in the sound quality itself. Not needing to turn the volume up to appreciate the full richness of sound could, potentially, spare some gamers the risk of incurring unnecessary hearing damage after hours of play. To accommodate different gamers who will potentially be using a great variety of different audio sources, the Ballista Trinity has been made for diverse multi-input support. Owners who use media players, PCs, iMacs, and mobile devices alike will all be able to reap full enjoyment from the audio quality that the speakers have to offer. The Ballista Trinity is fully compatible with any television set that has a built-in RCA. Customers have testified to the Ballista Trinity’s high audio intensity range, from smooth and quiet to extreme loudness. Most owners have expressed fascination at how the speakers are capable of producing such rich audio detail at relatively low levels of volume. Because the speakers have so much potential to create explosive bass at high frequencies, owners would be well-advised to take their time acclimating to the speakers before putting them on full blast right out of the box. One owner testified that they’d been familiar with AverMedia capture cards for some time, and since investing in the Ballista Trinity, they’ve found them to be the greatest thing to come out of the manufacturer to date. The owner hooked the Ballista Trinity up to their 40” Vizio 4k TV and claimed that the sound was equally impressive with any medium, not only limited to video games. The owner claimed that movies, music, and even regular TV watching were enhanced by the cutting edge sound clarity. The only downside that the customer mentioned was the fact that the speaker cables weren’t detachable; aside from that, they were confident in the Ballista Trinity speakers being a fine choice for just about anyone interested in having the best possible video game audio experience. GOgroove Basspulse speakers can accommodate a wide range of different computer model owners with cutting-edge sound clarity. Apple, ASUS, Acer, Alienware, Cybertron, Cyberpower, Dell, Lenovo, Samsung computers and more are compatible with GOgroove Basspulse speaker technology. These satellite speakers are made with a full-range design, with a full armory of high-end features to enhance the gaming experience. The advanced features include a side-firing subwoofer, front-loaded volume control, and bass equalizer; the all-inclusive feature selection should easily satisfy the needs of any gamer or audiophile. It’s an especially popular gift choice for students who like to play games in their dorm rooms or apartments. In addition to the wide range in different audio adjustment options, the Basspulse speakers are also capable of being matched up with a diverse range of different platform options. The different options for platforms that can be attached to the Basspulse speakers, aside from desktop computers, include MP3 players, iPods, tablets, smartphones, home theaters and any other devices that have 3.5mm AUX audio support. The exact sound configuration of those Basspulse speakers is calibrated towards dynamic highs, warm mid-tones and a deep level of bass. The peak power tops out at roughly 40 Watts, which while not necessarily the highest on the market, is still more than enough to create a deeply immersive and powerful listening experience with a full spectrum of audio intensity. Thanks to the subwoofer coming with its own equalizer, you can freely adjust the level of bass to your exact specifications. The Basspulse speakers are made with an aesthetic edge that works with the built-in LED lights. Every time that the audio is active, the lights will pulse with the beat of the music to increase the immersion of the experience. Owners can freely adjust exactly how much softness or brightness they’d prefer the LED pulsing to be. If the owner just wants the LED to have a soft accent, all they have to do is press the pulse button once. On the other hand, if they want the LED to dance and flash vigorously with the sound, turning up the bass equalizer beyond 80% will turn the face of the speakers into a booming light show. If the owner wants to adjust their speakers so that they can accept wireless input, such as Bluetooth, they can separately purchase a BlueGATE RCV from GOGroove to slip into the 3.5mm connection. Customers have testified that the appearance of the speakers alone was one of the things that they enjoyed most about them overall, particularly the smooth plastic shell. Customers have found that, for the value of sound quality that speakers produce, the value is quite economically satisfying. As far as downsides, customers have testified that the aesthetic appeal of the plastic may be slightly offset by the relatively brittle constitution. The main speakers are very thin and should not be exposed to significant pressure under any circumstances. Customers should be very careful when handling the speakers so as not to accidentally tip them over and so serious damage. The subwoofer has a reputation for being aggressively punchy, and so as a word of advice, customers are advised to be quite careful about turning the bass up too high at close proximity. The Genius SW-G2.1 speakers feature a distinguishing ultra-rigid MDF wooden cabinet subwoofer. The wood cabinet subwoofer increases the Genius speakers’ ability to create a sound that resonates throughout the owner’s room. 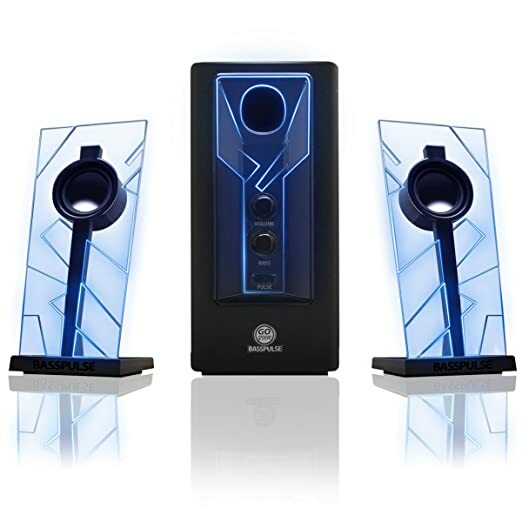 The total output power of the speakers is 45 watts, a mild buy respectably powerful level amongst all different degrees of wattage in the gaming speaker industry. Users have the ability to directly adjust the volume and bass with responsive controls. In addition to freely adjusting the volume and bass, owners can also flexibly adjust the physical setup of their sound system with hooked, mountable satellite speakers. PCs, TVs, DVDs, and a wide range of gaming devices can all be linked to the speakers with dual input jacks made for universal compatibility. If the owner wants a more private listening experience, the Genius speakers feature a 3.5mm headphone jack. In addition to the headphone jack, there’s also a 3.5mm microphone jack and a 3.5mm line input jack for television sets. Thanks to the jacks, owners can remove and insert any kind of apparatus into the speaker system relatively quickly. In addition to producing a great deal of audio richness, the sound system also features an LED system that pulses in tandem with the frequency of the audio. The pulsing LED light, rhythmically combined with the bass audio, helps to create a deeper sense of immersion while in the heat of gameplay. Like most high-end gaming speakers, owners have testified that the Genius speakers are useful for far more than just playing games. Owners have mentioned that the speakers have made for highly satisfying for watching movies or hosting parties. One of the main convenient features of the Genius speakers is the ease of disassembly. The only component that can’t be removed from the Genius speakers is the main power cable, which is hard-wired to the back of the main body. The control unit can be easily detached from the speakers, which makes it easy to connect them by fishing the connection through any holes in the owners’ desk or entertainment system. For the price, customers have testified that the Genius speakers provide a satisfyingly high value of quality. One customer reported that they had been using the Genius speakers with their iMac for about a week, and the satisfaction from hearing its sound quality hadn’t diminished a bit from the first time that they had plugged the speakers in. The customer testified that they were particularly impressed by the presentation of the keyboard, though at the same time, they had found the treble to be slightly sharper than what they had originally expected. 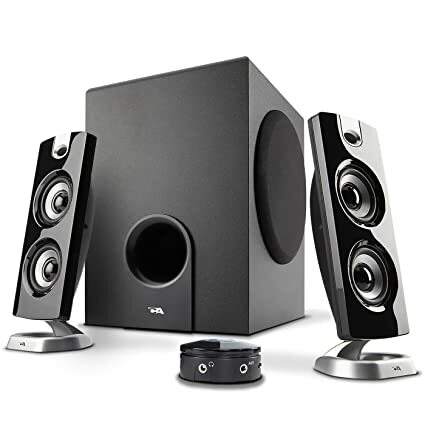 Other customers have expressed satisfaction at how light the subwoofer is, which when paired to the overall unit’s ease of disassembly, makes handing the Genius speakers very easy to do without any hassle. 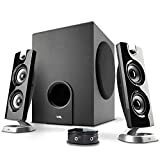 Some customers have stated that the speakers are generally better-suited when used for the purpose of near-field listening rather than blasting music through the entire house, but overall, the majority found the speakers to be more than adequate for filling up a bedroom-sized space. 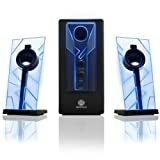 The Genius speaker system would most likely be best-suited for those who want a taste of higher-end capabilities of advanced sound systems without needing to go all the way into the most advanced options on the market. Cyber Acoustics 30 Watt powered speakers are a three-piece system of gaming immersion. In addition to the three-piece speakers, there are two 2” satellite speakers. The subwoofer features a wooden cabinet in order to optimally balance the acoustics to maximum quality. To protect the satellite speakers, magnetic shielding has been put in place. With the use of a desktop control pod, the owner can directly control the overall power output, the volume, and the bass. For added convenience that should be expected from any speaker made with the customer in mind, Cyber Acoustics speakers have a headphone jack and capability for auxiliary support. As far as power output is concerned, the Cyber Acoustics power cord is only meant for 110V. Thanks to the aforementioned wooden cabinet, the Cyber Acoustics subwoofer has a deepened capacity for creating bass with growling resonance – on the other hand, the wooden composition should be something that customers made sure to keep in mind. The cabinet being made of wood means that owners should take special care to ensure that the cabinet isn’t exposed to excessive heat. Customers have testified that, for the highly economic price, the Cyber Acoustics speakers produce a powerful degree of sound for their value. While the system’s capabilities may not line up to the very top of the line in quality, customers who are simply looking for decent sound quality have found the product to be surprisingly impressive. One customer did suggest that prospective buyers ought to be aware of the fact that the onboard volume controls that the user possesses on their particular output source may or may not affect the ultimate quality of the sound. The customer reported that they used a specific program on their iMac to tweak the audio functionality to their preferences, but others customers will likely want to do some research into whatever options their particular output source has for customizability. Another customer testified that the quality of the speakers impressed their particularly discerning ear as an experienced musician. As a trained musician, the customer testified that they do not enjoy hearing sounds at anything beneath high-end quality – because of this, their standards were particularly high. While the Cyber Acoustics speakers don’t sit that the very summit of high-end speaker quality, its sound richness was more than enough to satisfy the musically-attuned customer’s strict requirements. The customer stated that the sound was capable of being cranked up without getting distorted, and if pushed high enough, it would definitely be capable of getting the neighbors’ attention. It’s incredibly important to be wary of just how much space your speakers are going to take up, and in addition to that, just how much flexibility the different connection wires allow you when setting them up. Generally speaking, the more powerful speaker systems will generally take up a bit more space than speaker systems on the lower end. Take note of how easily the sound system can be disassembled, as this will allow you to install it more creatively. Some speakers come with remote controls included, which could be more or less important depending on your particular needs. Users who plan on listening to music without walking all the way over to their PC will naturally find remote controls useful, but generally speaking, most of the remote controls will only allow you to adjust the balance and volume without actually affecting playback – this is something that most gamers probably won’t find terribly helpful. While you’re probably be most concerned with the audio quality above all else, the additional features could still have different implications depending on your particular needs. Every different speaker system will have a way to adjust the volume, and if you choose to get a speaker with a subwoofer, then you’ll probably have access to bass control as well. Despite the adjustment features that may be included with the speakers themselves, some operating systems (such as Windows) might offer you the adjustment features on their own – it would pay to do some research on what the speakers offer that might be just as easily acquired through your own output source. When you’re considering whether or not to buy certain speakers, think about your particular level of need for subwoofer. The subwoofer is the source of that pumping bass that rattles every window in the room, which could naturally serve to make things like gunshots and explosions have extra impact. Take the size and openness of your room into account when making a decision, as larger speakers generally won’t work as well in enclosed spaces. While the immersion from a subwoofer can no doubt be attractive, consider your surroundings. If you’re going to be in a dorm room or an apartment complex, then having enough bass to make the whole floor shake might quickly wind up being slightly more trouble than its worth. If you decide that powerful subwoofer is exactly what you’re in the market for, then the next most important thing to consider will be just what level of surround sound intensity it is that you’re looking for. It’s important to be aware of the fact that there are no 5.1 surround sound system stets that don’t come with a subwoofer. While the 5.1 configuration might give you a much more intense experience, you may find that a 2.1 model can still provide relatively detailed audio without needing to be cranked up to maximum volume. High-end sound quality for your gaming experience can be acquired for a very reasonable price, but if you’re willing to spend just a few more quarters, then you’ll probably get even more than what you paid for. 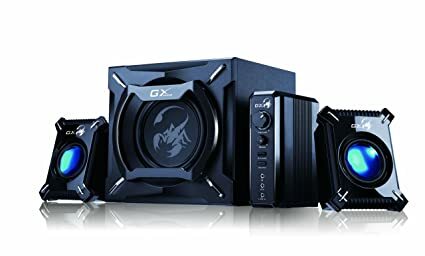 The most technologically sophisticated gamer speakers will generally be lightweight, universally connectable to all different output sources, and amplified with subwoofers to bring up the bass for maximum immersion. Be sure to take the size and acoustics of your room into account, along with the length of the cords that attach the different speaker system components to their various input/output points.